The Montgomery-Lay family is in Lombok, Indonesia. Jennifer Montgomery-Lay of Maple Ridge, B.C. says she felt 'sheer panic' when an earthquake rocked the area of Indonesia her family was visiting. LOMBOK, Indonesia — What was supposed to be a bucket-list family trip after her daughter was diagnosed with brain cancer, turned into a harrowing tale of survival mode as a powerful earthquake hit Indonesia leaving the family stuck on a popular tourist island, said a British Columbia woman. Jennifer Montgomery-Lay, of Maple Ridge, B.C., said that she, her husband, 14-year-old son and 21-year-old daughter are stuck in Lombok after a powerful 7.0-magnitude earthquake hit on Sunday evening. 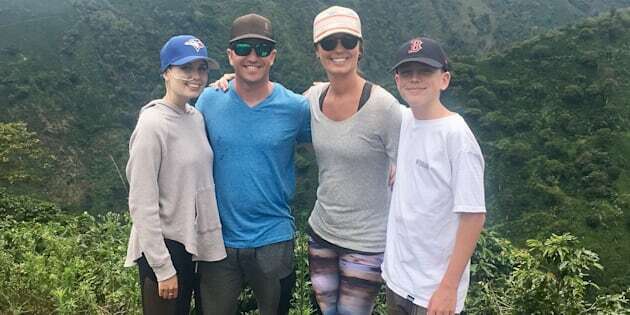 "I was in sheer panic, we all were,'' Montgomery-Lay, 41, told The Canadian Press on Monday from her hotel, adding that she and her family were not injured in the quake. The earthquake, which was also felt in the neighbouring island of Bali, flatted houses, caused bridges to collapse and killed at least 98 people. National Disaster Mitigation Agency spokesman Sutopo Purwo Nugroho told The Associated Press that the damage was "massive'' in northern Lombok, where the quake was centred, and that more than half the homes were destroyed or severely damaged. Nugroho said the death toll will increase and that more than 230 people were seriously injured. This was the second deadly quake in a week to strike Lombok. On July 29, a another quake left 16 people dead. Montgomery-Lay said she and her family have travelled to more than 20 countries after her daughter was diagnosed with brain cancer in 2005 and she's been battling it ever since. Montgomery-Lay started a blog titled "Life All Over the Map'' to document her daughter's treatment and the family's travels. "We live in uncertainty every single day, but we also know how lucky we are to be granted borrowed time and we don't want to waste one single second,'' wrote Montgomery-Lay on the blog's home page. Montgomery-Lay said the family has been vacationing in Indonesia for about a month, and that they were in Bali during last week's quake and they felt the ground shaking. On Sunday evening, the family had just gotten back to their hotel after dinner and Montgomery-Lay said she was about to organize her daughter's medication when the family experienced the powerful earthquake. Indonesian search and rescue personnel work on a collapsed mosque in Pemenang, North Lombok on Monday, the day after a 6.9 magnitude earthquake struck the area. Montgomery-Lay said parts of the hotel crumbled and glass from a balcony fell on a woman who was swimming in the hotel's pool, cutting her leg. She said the power went out and her daughter couldn't use one of her medication pumps, but the family is doing OK and a generator brought the power back on. She said the hotel occupants have now been moved to a holding room in the building. The quake also triggered a tsunami warning. Montgomery-Lay said her hotel is on higher ground so the meeting place when the warning was issued was by the building's main gate. The warning was lifted after only small waves were recorded. Montgomery-Lay said she was in touch with the Canadian Consulate, but she was told there was nothing they could do at that point. "There are no flights and the airport looks like mayhem,'' she said. There are 2,221 Canadians registrants abroad in Indonesia and 480 registered in Bali, said Elizabeth Reid, spokeswoman for Global Affairs Canada. She said as of Monday afternoon, the agency has no indication of Canadians being killed or injured in the earthquake. "Canada stands with the people of Indonesia during this difficult time. Global Affairs Canada is in contact with Canadians in the affected area and stands ready to provide consular assistance as required,'' said Reid in an email. A villager walks through a collapsed house after an earthquake hit Lombok Island in Pemenang, Indonesia on Monday. On Gili Trawangan, one of three popular vacation islands near Lombok, thousands of tourists and local residents spent the night on a hill fearing a tsunami. Nugroho said authorities had deployed three ships to evacuate people who were packed on the 16-square-kilometre beach. The Bali and Lombok airports have remained open. Montgomery-Lay said her family hasn't gone to the airport to try to get on a flight for fear of being stuck in the heat with her daughter's health condition. But she said the family is going to try to get on a ferry to Bali on Tuesday and that their flight back to B.C. is on Aug. 13.